While the rest of the country is planning their Thanksgiving menus, those of us in Alabama are planning our Iron Bowl menus! 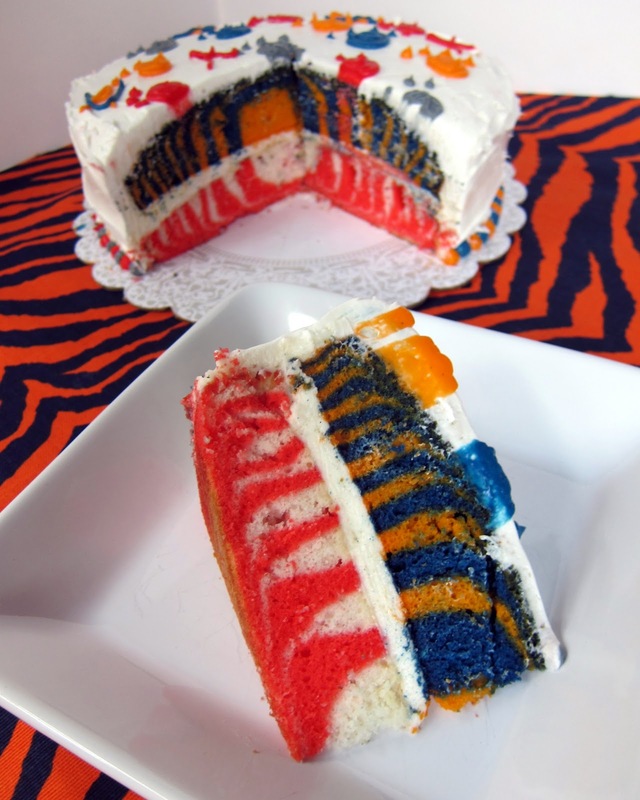 This Iron Bowl Zebra Cake is the perfect ending to any Iron Bowl party. It is really easy to make and has a great presentation! A zebra cake is traditionally vanilla and chocolate striped. 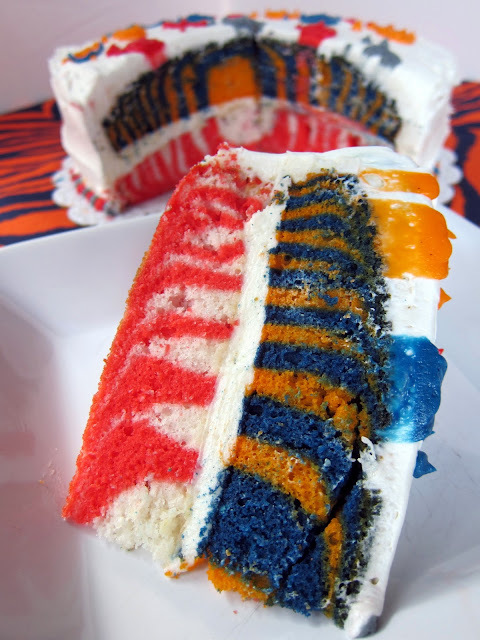 I wanted to make this a fun and festive Iron Bowl cake, so I used a white cake mix and tinted the layers orange & blue and red & white. It takes a few minutes to layer the batter into the pans, but the results are worth it. This cake is sure to impress! Bake according to package directions. Allow cake to cool and frost with buttercream frosting (recipe follows). You have outdone yourself! This is fabulous. Our dear friends coming in for the game this weekend are Iron Bowl fans (him AU; her BAMA) and I can't wait to show her. I've always told her she needs to get referee costumes for her kids for the game... :) This cake will be perfect for all next week's rivalry games...it could be adapted for lots of teams. Okay, this is SO CREATIVE and I pinned it immediately. Now I know what I'll do when I get back from my Black Friday adventures. War Eagle! Oh, and is that fabric fleece? I bought the remnant at Hancock's for a $1 fleece scarf. Love it! Good for a tailgating party! Such a cute cake! You put the wrong colors on top, though ;) Roll Tide! That is a work of art! RTR! This is great, Stephanie! War Eagle! Good luck with the game. I'm afraid you're going to walk into a buzzsaw on this one. Alabama has a lot to play for. The cake looks amazingly cute. I'm with Diana. Bama belongs on top. :) Roll Tide! Super cute idea, by the way!